1. Preheat the oven to 400°. In a small bowl, combine the butter, cayenne pepper and salt. In a shallow dish, combine the bread crumbs and coconut. 2. 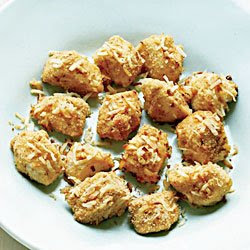 Brush the chicken cubes with the butter mixture, then toss in the coconut mixture to coat. Place the chicken on a rack set on a baking sheet and bake until crisp and golden, about 25 minutes.